I’m incredibly sad to report two things before I get started here. One, I forgot to think of anything witty for the intro. Two, Draven doesn’t have a ‘let me axe you a question’ joke. But what Draven does have is a metric half-ton of style. While Darius may be the most impressive model in a long while, his younger brother is the most impressive and most excellently realized concept in ages. A huge part of this success is Draven’s voice actor, Erik Braa. The man (who also does Jax) pulled off the cocky, showboating personality perfectly. Thankfully Draven’s model also looks good, with nice touches like actually spinning both axes when they’re ready, a great dance, and the best death animation since Wukong. Yeah, you killed Draven, but he’s always going to get the last laugh. I’d like to take a bit of time to talk about his other skin, something I haven’t done much of lately. With Soul Reaver Draven, Riot is really raising the bar for what makes a release-worthy skin. A completely redone model and somewhat different voice makes this one almost a must-have, but I love Draven’s original cocky attitude too much to get something more deathly and modulated. Either way, good job, Riot! 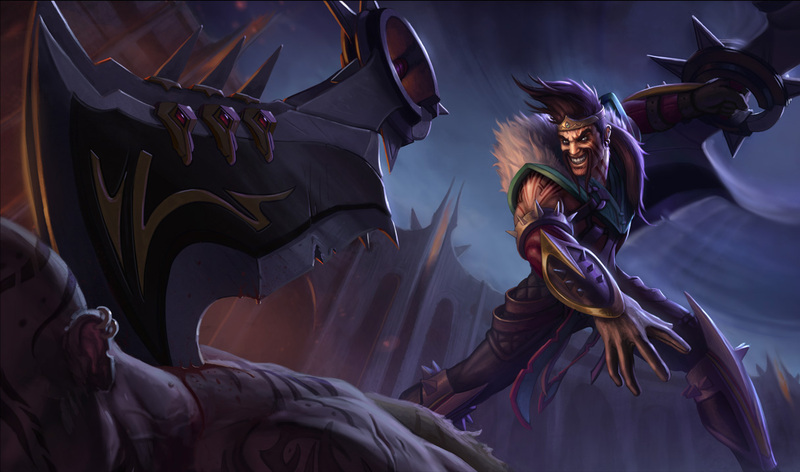 Moving onto his playstyle, Draven is another champion that rewards you for playing well. You can get off tons of damage with your passive/Spinning Axe and if you’re fast enough, you could keep a single axe (and a single mana cost) for a crazy amount of time. You’ve got to be careful, though. Enemies can see your axe (as people who have played against him probably know) and will take advantage of being predictable. If you don’t feel safe grabbing that axe, then let it drop. Draven is incredibly efficient when it comes to mana. I’ve never had any real trouble with him unless I ended up missing axes and having to re-cast them, or I used Stand Aside too often. Draven’s ultimate, while great for sniping kills, isn’t hugely useful. The part about it returning after it hits a champion is… finnicky, it seems. Half the time it does, half the time it doesn’t as far as my experiences go. Focus more on your Q and W for real damage. As far as building him goes, I’ve been using my basic AD carry runes and masteries and recommended items. In theory, it seems like a lifesteal heavy early build would work wonders, since his Q causes his next auto-attack to do bonus damage, which means bonus lifesteal. It also helps that he’s got a fairly spammable attack speed steroid. Basically, build him like you would any AD carry (maybe with some more mobility for easier axe-catching) and you should be pretty okay. All in all, Draven is super fun to play. If Varus didn’t quite do it for you and you’re looking for a new carry, then check him out. Bonus points if you like being fairly mobile and doing a lot of damage over time. Otherwise, wait until he’s free to give him a shot before you drop your hard-earned IP or money on the guy. As always, thanks for reading and have a good’un. This entry was posted in First Impressions, League of Legends, Video Games and tagged draven impressions, draven review, draven the glorious executioner, league of legends draven, lol draven. Bookmark the permalink. Mystia, I’m guessing you’re level 30 right? Yup! Been 30 for… about six months now, or so.